No it isn’t. Janet may prefer a dutch boy hair cut, but she’s not got her finger in the dike, nor is she warding off any other catastrophe. The deluge that is coming is actually the handiwork of the Fed and its bubble ridden Wall Street casino, not the capitalist hinterlands of main street. There are only two tangible transmission channels through which the Fed can impact our $18 trillion main street economy, as opposed to merely subsidizing Wall Street speculators to artificially bid up the price of existing financial assets. It can inject central bank credit conjured from thin air into the bond market in order to raise prices and lower yields. And it can falsify money market interest rates and the yield curve. Both of these effects are aimed at inducing businesses and households to borrow more than they would otherwise, and to then spend more than they produce. That’s the old Keynesian parlor trick and, yes, it worked 50 years ago when Janet’s Keynesian professors first had their way with America’s virgin balance sheets. But now those household and business balance sheets are all used up because we are at Peak Debt, along with most of the rest of the world. 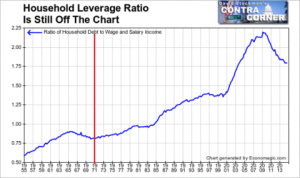 Indeed, in the case of the US household sector the massive leveraging up of wage and salary income between the late 1960s and 2008 has now begun to slowly reverse. The credit string that the Fed is pushing on is evident in the chart below. But apparently Janet is still in a time warp obeying the injunctions of James Tobin’s ghost wafting up from the earlier side of the red vertical. Accordingly, the stimulative effect of low and ultra-low interest rates never really leaves the canyons of Wall Street. And when it does, it trickles its way into credit extensions to the weakest borrowers left in the land. 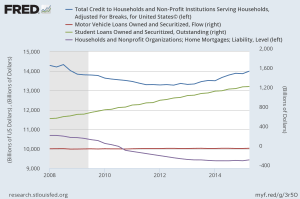 That is, students and subprime auto borrowers. Outside of those dubious precincts—– where the next wave of defaults or government bailouts will surely occur——there has actually been negative growth in household debt since the financial crisis. Notwithstanding 86 months of ZIRP and its current equivalent, total household debt is still $400 billion below it pre-crisis peak, and mortgage and credit card debt are down by more than $1 trillion. Likewise, the $2 trillion rise in total business debt outstanding has not gone into productive assets such as tangible plant, equipment and technology. It has been short-circuited into financial engineering by the false financial bubble fostered by Fed policies. That is, massive stock buybacks and M&A deal volumes have simply used the agency of the stock options obsessed C-suite to recycle newly issued business debt right back into the canyons of Wall Street. So if 86 months of ZIRP has already proved that the old Keynesian parlor trick—–which is the say, the household and business credit channel of monetary policy transmission—-is a dead letter, why in the world would Janet think that a few more basis points through the negative side of 0.0% would make any difference? And especially after the ECB has tried it, and to no avail! As is evident from the bank loan data for the Eurozone, credit extensions to private business have been sinking since 2012 when Draghi issued his “anything it takes” ukase. The ECB’s move to negative deposit rates last year has not changed that trend in the slightest. Likewise, household debt in Europe soared during the decade through 2010, but has been oscillating on the flat-line ever since. And the reason is beyond the power of the ECB or any central bank to remedy. Namely, European households are also at Peak Debt, meaning that central bank fiddling with negative deposit rates is pointless and irrational. It might seem puzzling that Yellen, Bernanke and their camp followers have all offered the European experience as a reason to revisit NIRP when the data is this dispositive the other way. But that’s because these monetary plumbers can’t tell the difference between transient squiggles and true, lasting trends. 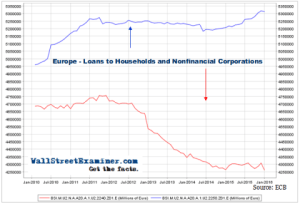 Here is a longer term look at bank credit extensions to households and businesses in the eurozone. You don’t need a PhD economist to explain why NIRP is a colossal failure in debt besotted Europe. Why do our central bankers think NIRP can possibly stimulate credit growth and old-fashioned Keynesian GDP expansion in a world of Peak Debt? Well, the truth is, they don’t think it; they assume it. Since they erroneously believe that capitalist main street is utterly dependent upon their constant ministrations, virtually any short-run development—adverse or otherwise—- is taken as evidence that more monetary policy intrusion is needed. Indeed, this faulty frame of mind has gone so far that they now interpret the negative feedback loop from their own bubble inflation as evidence that monetary conditions are too “tight” and more policy stimulus—-such as NIRP—-is warranted in order to offset headwinds to growth. Here is a doozy from Janet’s written testimony. Financial conditions in the United States have recently become less supportive of growth, with declines in broad measures of equity prices, higher borrowing rates for riskier borrowers, and a further appreciation of the dollar. These developments, if they prove persistent, could weigh on the outlook for economic activity….. It does not take much expertise to read the code. Simple Janet is saying that it doesn’t matter that the Fed has spent years falsely inflating equity markets via massive liquidity injections and props and puts under risk assets. Any correction in stock prices and any regression of ultra-tight credit spreads to normality which could cause economic and job growth to slow must be countered at all hazards. In short, the only thing they plan to do about a bursting bubble is to reflate it. It puts you in mind of the boy who killed his parents and then threw himself on the mercy of the courts on the grounds that he was an orphan! Stock prices sank as Ms. Yellen spoke. In what looks like a perverse feedback loop, she worries that market conditions could pinch the economy, and her lack of confidence sends markets lower still. At the end of the day, don’t take my word for it. Attached below is Simple Janet’s written testimony. It was indeed generated by a monetary android with a broken flash drive. Almost every line in it consists of notations about incoming data trivia that have been repeated month after month to absolutely no avail; or it references a simple-minded bathtub model of a closed US economy——one that is later contradicted by extended jawing about headwinds from China, global oil and commodity prices and shrinking US exports. Obviously, you can’t have it both ways. Either the Fed has total control of “aggregate demand” and can dial-up its monetary management controls until the US economy is full to the brim and all the “slack” is drained out of the labor market or there is massive leakage and interaction with the rest of the world. If it is the later—-and of course it is——then Simple Janet is truly lost in the Keynesian Puzzle Palace. 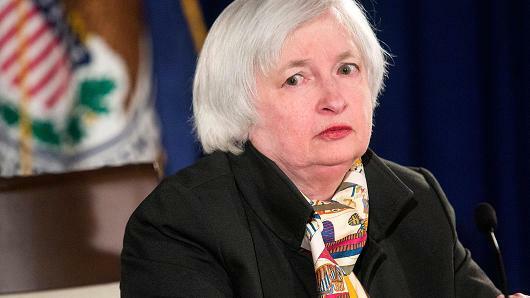 After all, why does she spend several paragraphs boasting about the Fed’s success in stimulating 13 million jobs and getting the U-3 unemployment rate down to 4.9% when by her own observation the US economy is being bludgeoned by an array of forces originating outside the bathtub of domestic GDP? Why do these labor market metrics even matter when they are subject to being trumped by forces far outside the Fed’s remit? Or has the Eccles Building now appointed itself central banker of the world? Although recent economic indicators do not suggest a sharp slowdown in Chinese growth, declines in the foreign exchange value of the renminbi have intensified uncertainty about China’s exchange-rate policy and the prospects for its economy. This uncertainty led to increased volatility in global financial markets and, against the background of persistent weakness abroad, exacerbated concerns about the outlook for global growth. These growth concerns, along with strong supply conditions and high inventories, contributed to the recent fall in the prices of oil and other commodities. In turn, low commodity prices could trigger financial stresses in commodity-exporting economies, particularly in vulnerable emerging-market economies, and for commodity-producing firms in many countries. Should any of these downside risks materialize, foreign activity and demand for U.S. exports could weaken and financial market conditions could tighten further. The point is, Simple Janet is just emitting jabberwocky. The above paragraph completely negates the notion that there is a purely domestic business cycle that the Fed can manage and manipulate to the perfection of full employment. In fact, today’s $80 trillion global economy is endowed with a plethora of stormy seas by Simple Janet’s own account. So why would you measure jobs growth from the very bottom month of the recession or even bother to reference the totally flawed U-3 unemployment rate in a world of gigs, temps and hours, not 40 hour work weeks at the Ford factory? The fact is, 62% of the job gains cited by Yellen are “born again” jobs; only 5 million net jobs have been created since the pre-crisis peak, representing the weakest growth rate in modern history. Likewise, the employment to population ratio is still at modern lows and has recovered only a small fraction of its post-crisis loss; it renders the U-3 rate essentially meaningless. So here’s the thing. Simple Janet and her posse are completely lost. And now they are thrashing about randomly pretending to be managing the monetary dials in the Eccles Building based on the incoming data. No they are not. They are sliding by the seat of their pants. They have declared war on savers and are fixing to make their assault even more viscous. And their phony wealth effects doctrine is blowing-up in their face, reducing the financial markets to the status of a theme park roller coaster ride. If Simple Janet occupied any office in the elective branches of government she would have been in the impeachment docket long ago. Maybe The Donald will take notice of her assault on tens of millions of retirees, savers, main street business people and just plain folks. They are all being sacrificed to Simple Janet’s Keynesian lunacy and the last grasp of the Wall Street gamblers. So after all that has gone before, it will only take one loud voice to trigger an uprising against the crime of NIRP—–and then the casino will discovery what real price discovery is all about. Since my appearance before this Committee last July, the economy has made further progress toward the Federal Reserve’s objective of maximum employment. And while inflation is expected to remain low in the near term, in part because of the further declines in energy prices, the Federal Open Market Committee (FOMC) expects that inflation will rise to its 2 percent objective over the medium term. In the labor market, the number of nonfarm payroll jobs rose 2.7 million in 2015, and posted a further gain of 150,000 in January of this year. The cumulative increase in employment since its trough in early 2010, is now more than 13 million jobs. Meanwhile, the unemployment rate fell to 4.9 percent in January, 0.8 percentage point below its level a year ago and in line with the median of FOMC participants’ most recent estimates of its longer-run normal level. Other measures of labor market conditions have also shown solid improvement, with noticeable declines over the past year in the number of individuals who want and are available to work but have not actively searched recently, and in the number of people who are working part time but would rather work full time. However, these measures remain above the levels seen prior to the recession, suggesting that some slack in labor markets remains. Thus, while labor market conditions have improved substantially, there is still room for further sustainable improvement. The strong gains in the job market last year were accompanied by a continued moderate expansion in economic activity. U.S. real gross domestic product is estimated to have increased about 1-3/4 percent in 2015. Over the course of the year, subdued foreign growth and the appreciation of the dollar restrained net exports. In the fourth quarter of last year, growth in the gross domestic product is reported to have slowed more sharply, to an annual rate of just 3/4 percent; again, growth was held back by weak net exports as well as by a negative contribution from inventory investment. Although private domestic final demand appears to have slowed somewhat in the fourth quarter, it has continued to advance. Household spending has been supported by steady job gains and solid growth in real disposable income–aided in part by the declines in oil prices. One area of particular strength has been purchases of cars and light trucks; sales of these vehicles in 2015, reached their highest level ever. In the drilling and mining sector, lower oil prices have caused companies to slash jobs and sharply cut capital outlays, but in most other sectors, business investment rose over the second half of last year. And homebuilding activity has continued to move up, on balance, although the level of new construction remains well below the longer-run levels implied by demographic trends. Financial conditions in the United States have recently become less supportive of growth, with declines in broad measures of equity prices, higher borrowing rates for riskier borrowers, and a further appreciation of the dollar. These developments, if they prove persistent, could weigh on the outlook for economic activity and the labor market, although declines in longer-term interest rates and oil prices provide some offset. Still, ongoing employment gains and faster wage growth should support the growth of real incomes and therefore consumer spending, and global economic growth should pick up over time, supported by highly accommodative monetary policies abroad. Against this backdrop, the Committee expects that with gradual adjustments in the stance of monetary policy, economic activity will expand at a moderate pace in coming years and that labor market indicators will continue to strengthen. As is always the case, the economic outlook is uncertain. Foreign economic developments, in particular, pose risks to U.S. economic growth. Most notably, although recent economic indicators do not suggest a sharp slowdown in Chinese growth, declines in the foreign exchange value of the renminbi have intensified uncertainty about China’s exchange rate policy and the prospects for its economy. This uncertainty led to increased volatility in global financial markets and, against the background of persistent weakness abroad, exacerbated concerns about the outlook for global growth. These growth concerns, along with strong supply conditions and high inventories, contributed to the recent fall in the prices of oil and other commodities. In turn, low commodity prices could trigger financial stresses in commodity-exporting economies, particularly in vulnerable emerging market economies, and for commodity-producing firms in many countries. Should any of these downside risks materialize, foreign activity and demand for U.S. exports could weaken and financial market conditions could tighten further. Of course, economic growth could also exceed our projections for a number of reasons, including the possibility that low oil prices will boost U.S. economic growth more than we expect. At present, the Committee is closely monitoring global economic and financial developments, as well as assessing their implications for the labor market and inflation and the balance of risks to the outlook. As I noted earlier, inflation continues to run below the Committee’s 2 percent objective. Overall consumer prices, as measured by the price index for personal consumption expenditures, increased just 1/2 percent over the 12 months of 2015. To a large extent, the low average pace of inflation last year can be traced to the earlier steep declines in oil prices and in the prices of other imported goods. And, given the recent further declines in the prices of oil and other commodities, as well as the further appreciation of the dollar, the Committee expects inflation to remain low in the near term. However, once oil and import prices stop falling, the downward pressure on domestic inflation from those sources should wane, and as the labor market strengthens further, inflation is expected to rise gradually to 2 percent over the medium term. In light of the current shortfall of inflation from 2 percent, the Committee is carefully monitoring actual and expected progress toward its inflation goal. Of course, inflation expectations play an important role in the inflation process, and the Committee’s confidence in the inflation outlook depends importantly on the degree to which longer-run inflation expectations remain well anchored. It is worth noting, in this regard, that market-based measures of inflation compensation have moved down to historically low levels; our analysis suggests that changes in risk and liquidity premiums over the past year and a half contributed significantly to these declines. Some survey measures of longer-run inflation expectations are also at the low end of their recent ranges; overall, however, they have been reasonably stable. Turning to monetary policy, the FOMC conducts policy to promote maximum employment and price stability, as required by our statutory mandate from the Congress. Last March, the Committee stated that it would be appropriate to raise the target range for the federal funds rate when it had seen further improvement in the labor market and was reasonably confident that inflation would move back to its 2 percent objective over the medium term. In December, the Committee judged that these two criteria had been satisfied and decided to raise the target range for the federal funds rate 1/4 percentage point, to between 1/4 and 1/2 percent. This increase marked the end of a seven-year period during which the federal funds rate was held near zero. The Committee did not adjust the target range in January. The decision in December to raise the federal funds rate reflected the Committee’s assessment that, even after a modest reduction in policy accommodation, economic activity would continue to expand at a moderate pace and labor market indicators would continue to strengthen. Although inflation was running below the Committee’s longer-run objective, the FOMC judged that much of the softness in inflation was attributable to transitory factors that are likely to abate over time, and that diminishing slack in labor and product markets would help move inflation toward 2 percent. In addition, the Committee recognized that it takes time for monetary policy actions to affect economic conditions. If the FOMC delayed the start of policy normalization for too long, it might have to tighten policy relatively abruptly in the future to keep the economy from overheating and inflation from significantly overshooting its objective. Such an abrupt tightening could increase the risk of pushing the economy into recession. It is important to note that even after this increase, the stance of monetary policy remains accommodative. The FOMC anticipates that economic conditions will evolve in a manner that will warrant only gradual increases in the federal funds rate. In addition, the Committee expects that the federal funds rate is likely to remain, for some time, below the levels that are expected to prevail in the longer run. This expectation is consistent with the view that the neutral nominal federal funds rate–defined as the value of the federal funds rate that would be neither expansionary nor contractionary if the economy was operating near potential–is currently low by historical standards and is likely to rise only gradually over time. The low level of the neutral federal funds rate may be partially attributable to a range of persistent economic headwinds–such as limited access to credit for some borrowers, weak growth abroad, and a significant appreciation of the dollar–that have weighed on aggregate demand. Of course, monetary policy is by no means on a preset course. The actual path of the federal funds rate will depend on what incoming data tell us about the economic outlook, and we will regularly reassess what level of the federal funds rate is consistent with achieving and maintaining maximum employment and 2 percent inflation. In doing so, we will take into account a wide range of information, including measures of labor market conditions, indicators of inflation pressures and inflation expectations, and readings on financial and international developments. In particular, stronger growth or a more rapid increase in inflation than the Committee currently anticipates would suggest that the neutral federal funds rate was rising more quickly than expected, making it appropriate to raise the federal funds rate more quickly as well. Conversely, if the economy were to disappoint, a lower path of the federal funds rate would be appropriate. We are committed to our dual objectives, and we will adjust policy as appropriate to foster financial conditions consistent with the attainment of our objectives over time. Consistent with its previous communications, the Federal Reserve used interest on excess reserves (IOER) and overnight reverse repurchase (RRP) operations to move the federal funds rate into the new target range. The adjustment to the IOER rate has been particularly important in raising the federal funds rate and short-term interest rates more generally in an environment of abundant bank reserves. Meanwhile, overnight RRP operations complement the IOER rate by establishing a soft floor on money market interest rates. The IOER rate and the overnight RRP operations allowed the FOMC to control the federal funds rate effectively without having to first shrink its balance sheet by selling a large part of its holdings of longer-term securities. The Committee judged that removing monetary policy accommodation by the traditional approach of raising short-term interest rates is preferable to selling longer-term assets because such sales could be difficult to calibrate and could generate unexpected financial market reactions. The Committee is continuing its policy of reinvesting proceeds from maturing Treasury securities and principal payments from agency debt and mortgage-backed securities. As highlighted in the December statement, the FOMC anticipates continuing this policy “until normalization of the level of the federal funds rate is well under way.” Maintaining our sizable holdings of longer-term securities should help maintain accommodative financial conditions and reduce the risk that we might need to return the federal funds rate target to the effective lower bound in response to future adverse shocks.